Fig. 10.5. Variation of stresses beneath the surface of contacting spheres. For other, more general, loading cases the reader is referred to a list of formulae presented by Roark and Young'33'. It should be evident from the preceding sections that the maximum Hertzian compressive stress is not, in itself, a valid criteria of failure for contacting members although it can be used as a valid design guide provided that more critical stress states which have a more direct influence on failure can be related directly to it. 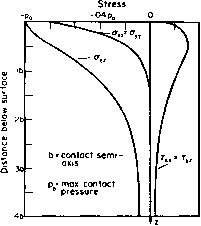 It has been shown, for example, that alternating shear stresses exist beneath the surface which are probably critical to fatigue life but these can be expressed as a simple proportion of the Hertzian pressure po so that po can be used as a simple index of contact load severity. The contact situation is complicated under real service loading conditions by the presence of e.g. residual stresses in hardened surfaces, local yielding and associated additional residual stresses, friction forces and lubrication, thermal stresses and dynamic (including shock) load effects. The failure of brittle materials under contact conditions correlates more closely with the maximum tensile stress at the surface rather than sub-surface shear stresses, whilst for static or very slow rolling operations failure normally arises as a result of excessive plastic flow producing indentation ("brinelling") of the surface. In both cases, however, the Hertzian pressure remains a valuable design guide or reference. By far the greatest number of failures of contacting components remains the surface or sub-surface fatigue initiated type variably known as "pitting", "spoiling", "onion-peel spalling" or "flaking". The principal service areas in which this type of failure occurs are gears and bearings. Fig. 10.6. Stress conditions in the region of gear tooth contact. through mesh giving a stress range greater than that of rmax which ranges between a single value and zero. It is argued by many that, for this reason, rait is probably more significant to fatigue life than rmax - particularly if its depth relates closely to that of peak residual stresses or case-core junctions of hardened gears. As the gears rotate there is a combination of rolling and sliding motions, the latter causing additional surface stresses not shown in Fig. 8.6. 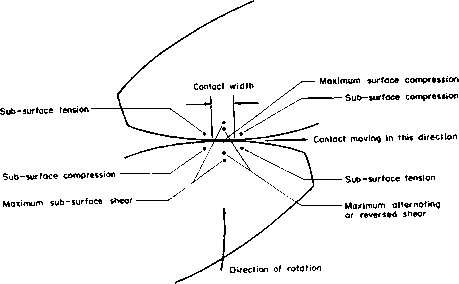 Ahead of the contact area there is a narrow band of compression and behind the contact area a narrow band of tension. A single point on the surface of a gear tooth therefore passes through a complex variety of stress conditions as it goes through its meshing cycle. Both the surface and alternating stress change sign and other sub-surface stresses change from zero to their maximum value. Add to these fatigue situations the effects of residual stress, lubrication, thermal stresses and dynamic loading and it is not surprising that gears may fail in one of a number of ways either at the surface or sub-surface. The majority of gear tooth failures are surface failures due to "pitting", "spalling", "flaking", "wear", etc. the three former modes referring to the fracture and shedding of pieces of various size from the surface. Considerable speculation and diverse views exist even among leading workers as to the true point of origin of some of these failures and considerable evidence has been produced of, apparently, both surface and sub-surface crack initiation. The logical conclusion would therefore seem to be that both types of initiation are possible depending on precisely the type of loading and contact conditions. A strong body of opinion supports the suggestion of Johnson"4'16) and Almen(30) who attribute contact stress failures to local plastic flow at inclusions or flaws in the material, particularly in situations where a known overload has occurred at some time prior to failure. The overload is sufficient to produce the initial plastic flow and successive cycles then extend the region of plasticity and crack propagation commences. Dawson'25' and Akaoka'3" found evidence of sub-surface cracks running parallel to the surface, some breaking through to the surface, others completely unconnected with it. These were attributed to the fatigue action of the maximum alternating (reversed) shear stress. Undoubtedly, from the evidence presented by other authors, cracks can also initiate at the surface probably producing a "pitting" type of failure, i.e. smaller depth of damage. 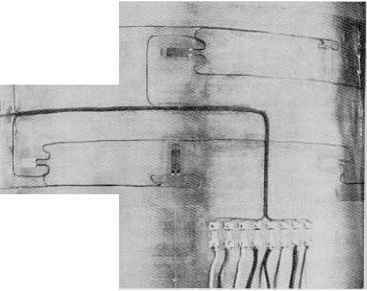 These cracks are suggested to initiate at positions of maximum tensile stress in the contact surface and subsequent propagation is then influenced by the presence (or otherwise) of lubricant. In the case of helical gears, three-dimensional photoelastic tests undertaken by the author'32' indicate that maximum sub-surface stresses are considerably greater than those predicted by standard design procedures based on Hertzian contact and uniform loading along the contact line. Considerable non-uniformity of load was demonstrated which, together with dynamic effects, can cause maximum loads and stresses many times above the predicted nominal values. The tests showed the considerable benefit to be gained on the load distribution and resulting maximum stress values by the use of tip and end relief of the helical gear tooth profile. where m + 1" m with W — tangential driving load = pinion torque pinion pitch radius Fw = face width d = pinion pitch diameter m = ratio of gear teeth to pinion teeth; the pinion taken to be the smaller of the two mating teeth. For helical gears, the maximum contact stress is given by where K is the same factor as for spur gears mp is the profile contact ratio C is a constant the values of mp and C being found in Table 10.2, for various helix angles and pressure angles.